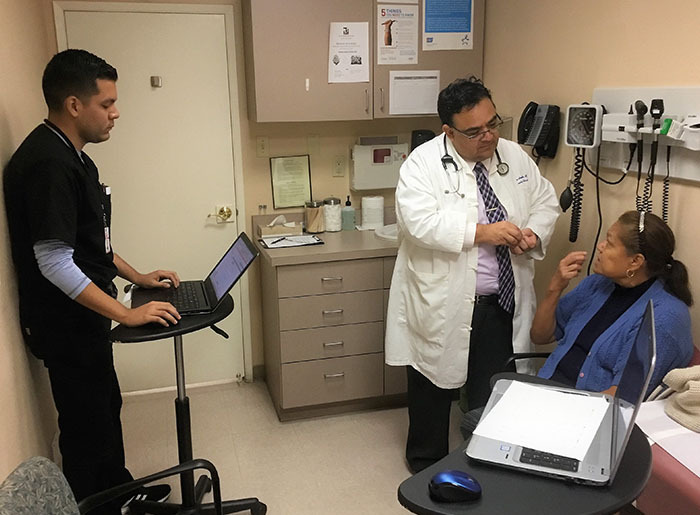 Marco Angulo, MD, talks to patient Maria Alvarez about tests to track her diabetes at the Serve the People Community Health Center in Santa Ana, California. Angulo’s educational journey began in community college and led him to become a mentor to people following that path. Photo: Padma Nagappan. As a struggling high school student, Marco Angulo, MD, never anticipated that he would one day become a primary care doctor committed to making a difference in his community. But not only has Angulo become an influential figure with his patients, he is now encouraging a growing number of minority students in community colleges and local universities in Orange County to follow his path into careers in medicine. That’s very good news for primary care in California. One in three physicians trained in family medicine started their higher education in community college, according to recent research. Angulo, 48, was raised in the Latino working-class community of East Los Angeles by parents who immigrated from Juarez, Mexico. His father told him early on that he would have to choose whether to work with his hands or his mind. He became a guitarist, living from gig to gig, barely making ends meet, getting kicked out of apartments for failing to pay rent. Marco Angulo talks to patient Maria Alvarez while scribe Aaron Zaldana takes notes. Zaldana hopes to be a doctor and is being mentored by Angulo. Photo: Padma Nagappan. When he turned 26, Angulo had an epiphany about his life. He went back to school, enrolling in East Los Angeles College for night classes in Chicano studies. “I fell in love with studying and realized I could do pretty good in my classes,” he said. At the community college, he discovered Chicanos/Latinos for Community Medicine, a student organization with chapters at colleges and universities in several western states. The group provides support to pursue health-related degrees and careers and fosters a commitment to improve health care in underserved communities. Soon he switched to pre-med coursework. Given his track record, some tried to discourage him. But the professors at his community college gave guidance and believed in him, he said. After two and a half years, he transferred to UC Berkeley. It was demanding, but he was ready. After graduating at age 32, Angulo stayed on at Berkeley for four more years, counseling pre-med students in a diversity program for biology scholars. When he was ready to take the plunge and go to medical school himself, he was admitted to UC Irvine. There he discovered other medical students who had gone to community college for financial reasons and who had decided from the get-go to specialize in family medicine. At 36, Angulo was the oldest incoming med student at UC Irvine. He enrolled in the Program in Medical Education for the Latino Community (PRIME-LC), and he graduated with an MD-MS double degree with a focus on diversity in medicine. Angulo is now medical director of the Serve the People Community Health Center in Santa Ana, a Federally Qualified Health Center serving a predominantly working-class Latino community. Community colleges already have a recognized role providing training for a wide range of health professions, including registered nurses, physician assistants, medical technicians, and paramedics. But they generally have not been considered a major source of medical school students. However, recent research from UC Davis published in Annals of Family Medicine suggests that cultivating the pathway from community college to medical school could help solve California’s looming primary care physician shortage. The study, which focused on trainees in residency who graduated from medical school between 2010 and 2012, found that those who attended community college as pre-med students were more likely to choose family medicine. Of more than 43,000 newly minted doctors nationwide in that period, only 9% trained in family medicine. But there was also this significant finding: Among those who did choose family medicine, 34% attended community college before medical school. What’s more, 33% of whites, 35% of Asians, 50% of Latinos, and 33% of African Americans who chose family medicine were first-generation college graduates who had attended community college. When the study was published in July 2018, lead author Efrain Talamantes, MD, was codirector of the Center for a Diverse Healthcare Workforce at UC Davis. He researched the trend after noticing that many of the minority pre-med and medical students whom he mentored had attended community college. “We think that community college students, because of who they are and where they come from, probably have a stronger affinity for family medicine, which offers the opportunity to address community issues and social determinants of health,” said Talamantes. He is now director of health equity at Altamed, a primary care organization in Los Angeles serving underinsured, uninsured, and Medi-Cal patients. Residents appear to be reluctant to venture outside metropolitan areas to smaller cities and rural areas where demand for services is high and the physician supply is low. Most physicians are not inclined to move far from where they trained and prefer to practice in larger cities. Isabelle Becerra, CEO of the Coalition of Orange County Community Health Centers, works with several physicians like Angulo, and says their impact can’t be overstated. The coalition has experimented with innovations such as having patients come in groups of up to 20 for counseling and classes on diabetes, hypertension, and weight issues. The pilot program was tested in five clinics, and none had as much success as Angulo’s clinic because others didn’t relate to patients as effectively, Becerra said. Angulo has worked with Becerra to develop a Health Scholars program to encourage people of color to choose careers as health care professionals. Established in 2015, they now shepherd 65 pre-med and medical school students, exposing them to working in community health centers and helping them prepare for medical school admissions testing and interviews. Padma Nagappan is an independent journalist who covers health, environment, and agriculture. Within the health beat, she focuses on public health issues, health impacts of environmental issues, medical advances, and medical research. She has reported on substance abuse and the opioid crisis, health disparities, cancer, mental health, and drug interactions. Her stories have been published in media outlets in the US and UK, including Everyday Health, Dermatology Times, New Scientist, TakePart, MedShadow, Ag Alert, SugarOnline, San Diego Union-Tribune, and KPBS TV and Radio. Padma earned a master’s degree in business administration from Madurai Kamaraj University in India. She is based in San Diego.